Academic Encounters is an academic preparation series that uses authentic materials and a sustained-content approach to teach students the skills they need to take college courses in English . 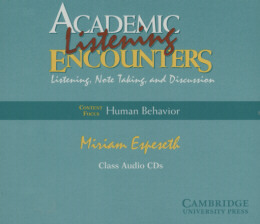 There are two books in the series for each content focus: an Academic Encounters title that teaches reading, study skills, and writing; and an Academic Listening Encounters title that concentrates on developing student´listening, note-taking, and discussion skills. The two books may be used independently anied by fluency activities and offer a variety of approaches to vocabulary development.through improvisations around the business themes.